Nanotechnology may someday expand your cell phone's range while improving its battery life if a prototype transistor from IBM gets to market. Researchers at the company are using nanotechnology to build a future generation of wireless transceivers that are much more sensitive than the ones found in phones today. They'll also be made with a less expensive material, according to IBM. The catch is that the new chips probably won't make it into consumers' hands for another five or ten years. The scientists, sponsored by DARPA (the U.S. Defense Advanced Research Projects Agency), have built prototype transistors with the new material, called graphene. It is a form of graphite that consists of a single layer of carbon atoms arranged in a honeycomb pattern. Graphene's structure allows electrons to travel through it very quickly and gives it greater efficiency than existing transceiver chip materials, said Yu-Ming Lin, a research staff member at IBM in Yorktown Heights, New York. The project is part of DARPA's CERA (Carbon Electronics for radio-frequency applications) program. IBM announced Thursday the researchers have achieved a frequency of 26GHz on prototype graphene transistors. The transistors used in the test had a gate length of 150 nanometers, and the researchers are aiming for a 50nm gate length that would allow for frequencies above 1THz. Those frequencies are far above what cellular networks use today. There may be military and medical uses for frequencies above 1THz, such as seeing concealed weapons or doing medical imaging without using harmful x-rays, Lin said. Unlike an x-ray, frequencies in the terahertz range would be lower than the frequency of visible light, so it wouldn't have the same radiation dangers, he said. But at conventional frequencies, graphene-based transceivers could make both cell phones and base stations more sensitive and better able to pick up weak signals. The key is signal-to-noise ratio, or being able to distinguish the radio signal from the other waves around it. At a given distance, a phone with a better signal-to-noise ratio can take better advantage of the signal available from the nearest cell tower. A more sensitive phone might even work in areas where today's phones can't, Lin said. In addition, graphene chips consume less power than today's cell-phone radios, so batteries could last longer, Lin said. Several specialized materials have been used in high-frequency radios, among them gallium arsenide, germanium and indium phosphide. Graphene is a less expensive alternative that could operate at higher frequencies than those, he said. It is a two-dimensional substance made of carbon, which Lin compared to a unwrapped nanotube. 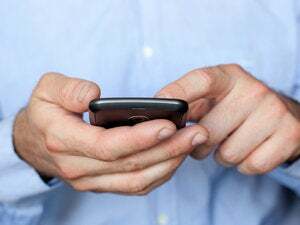 Cell-phone makers definitely are striving to give users better signals and longer battery life, as well as to cut costs, said Gartner analyst Stan Bruederle. In fact, mobile operators are being forced to put up more base stations to get close enough to subscribers to deliver the high data rates they're looking for with 3G (third-generation) services. More sensitive radios might ease that burden. But there's no guarantee they'll jump on graphene chips as the best solution, Bruederle said. A current trend is to use existing CMOS (complementary metal-oxide semiconductor) technology for transceivers and integrate them with other cell-phone components in one chip. This lowers costs through both integration and use of a high-volume chip technology, Bruederle said. Competing against that kind of process, graphene would probably not make it to market for closer to 10 years, he said. "Clearly, CMOS is starting to face some challenges" in continuing to reach higher performance, Bruederle said. "But engineers are amazingly innovative. It's a moving target."